Toby Wynn likes what he sees so far. The 2-0 Seward Lady Saints have played two games and eight different players have scored in double digits. Friday night five scored in double figures in Seward’s 95-44 win over the Southwestern Christian Lady Rams in the Green House. SCCC shot 51 percent. Their defense was just as impressive holding the Lady Rams from Terrell, Texas and Region 5 to under 21 percent shooting. Mariah Lee was dominant inside with 24 points and 12 rebounds. Ashlynn Knoll added 14 points and seven boards. Satanta’s Kelsey Blair hit two three pointers and scored 11. Hanna Bogner added 10 points and nine rebounds while Kayla Thomas added 10 points and five rebounds. 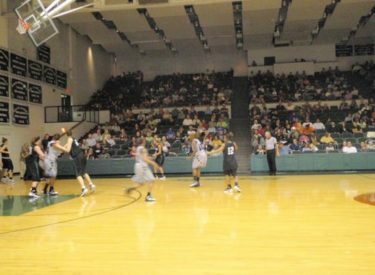 Seward led 52-20 at halftime in front of a big Green House crowd on opening night. The Lady Saints host 0-2 Air Force Prep Saturday night at 6 p.m. for game two of the Pepsi Classic. The Lady Huskies lost 72-58 Friday afternoon to Garden City in the Green House. Southwestern Heights’ Deni Jacobs had eight points and seven rebounds for GCCC. Garden plays Soutwestern Christian Saturday at 2 p.m. to begin day two of the Pepsi Classic. Saturday night’s game will air on Talkradio 1270 and kscbnews.net.